Vote on your favourite option. Vote on your favourite option and discuss. THIS POLL HAS NO BARRINGS ON ANYTHING I MIGHT DO! NOPE! NONE AT ALL! 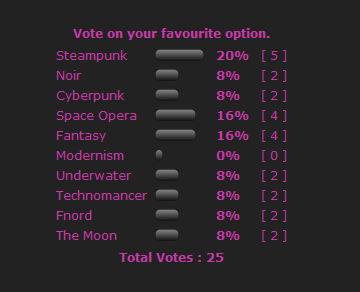 A steampunk space opera would be . Someone needs to PUSH ALL THE BUTTONS! DING DING DING! Time is up! The top three votes were. Steampunk fantasy on the Moon?